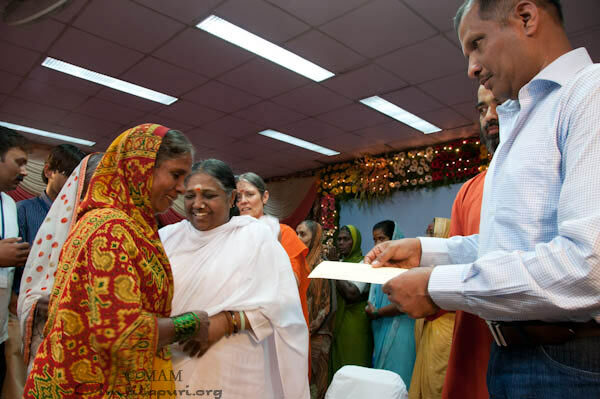 At a time when children are forgetting their responsibilities to their elderly parents, denying them basic necessities such as food and shelter, Amma’s compassion has come as a welcome and much needed respite in the form of a monthly pension scheme for impoverished women. Pensions for widows started in 1998. The physically and mentally challenged and others living below the poverty line as well receiving the financial benefit. Nation-wide, 59,000 qualified people are now receiving Amrita Nidhi pensions who are struggling to make ends meet. Recognizing that disability or the loss of a family member can consign those in the developing world to a lifetime of hardship, our pensions have no expiration date—they are given for life. In the first three months project, the Amrita Nidhi co-ordinator, Sarada, processed 10,000 applications. She was assisted by volunteers who helped her process hundreds of letters everyday. Sarada and her team spent more than one year going through application forms and meeting the applicants.